Discussion in 'Paddles and Paddle Making' started by Murat V, May 6, 2011. 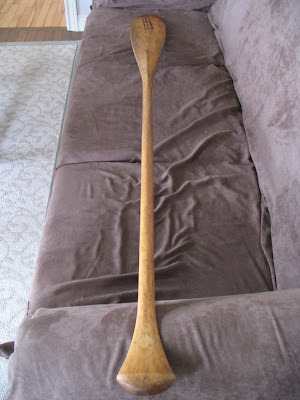 I got a query from someone restoring an antique maple paddle found in a barn and am posting pics here on his behalf. 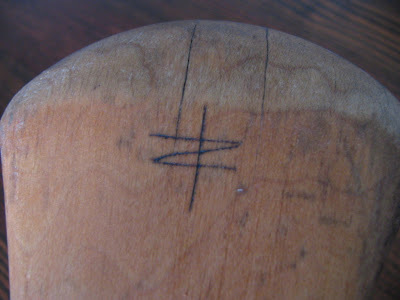 The whole thing is in rough shape but a clear mark, believed to be from a small scale maker, is etched into the face of the grip. It is in the shape of a "Z" with a vertical line through it. Probably a long shot but wondering if anyone has seen this maker's symbol before and has any extra info. I don't think it's Zorro. He didn't use a vertical line through the 'Z'. My guess is Zelda and the vertical line is the sword. Seriously though, I haven't a clue. But it could also be the owner's mark, rather than the maker's. Ya never know. Beaten to the punch by Andre! It' appears to be the owners mark...it' a bit crude for a "makers mark". The paddle looks like a Peterborough. I have one just like it. Look for evidence of a round decal on the shaft about 1/3 of the way up from the blade. Just signed up only to make this post, wish they just had a guest comment feature. Anyways, I wanted to tell you I don't know for sure its related, but this exact symbol, with the particular scrunched up Z and long vertical line is my family's chosen symbol. When i was a kid my grandfather told me it was his great grandfather's mark, which developed from his fascination with native american culture and some spiritualy stuff. story shortened, he saw this symbol in his mind whenever he achieved his desired mental state. My entire family have always been Freemasons as well as craftsman, which is where the love of symbols that gave birth to this one came from. It would honestly not surprise me in the least if someone in my distant family made this way back in the day. It was cool to see it online! Other then some currency symbol proposals that failed, i've never seen anything that resembles it outside of family keep-sakes, let alone right to the Z lol thanks for your post! glad i decided to just lookup the symbol today for something to do! OK. I'll bite......I think it is a simple statement of YIN/YANG......there is a much to observe/share etc. above the line as there is below. So there, and as the saying goes..." take it or leave it ". Now , time for a nap.